NJ Governor Chris Christie hosts Chanukah Party For the third year, Governor and Mrs. Christie hosted a private Chanukah reception for more than 250 leaders of the NJ Jewish Community. The catered affair was entirely Glatt Kosher and featured Chazzan Aryeh Spilman. 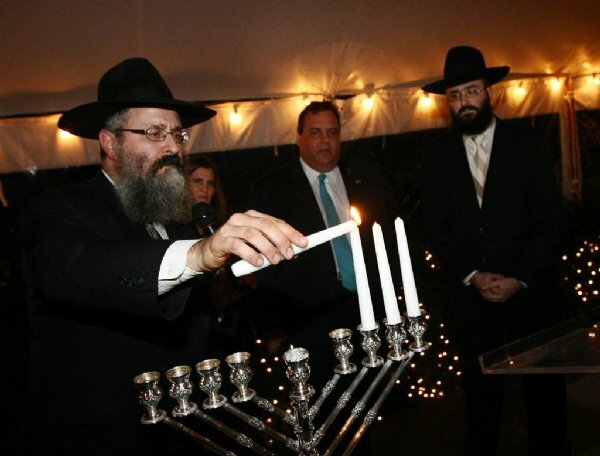 Rabbi Yosef Carlebach - Director Chabad of Central and South NJ, Rabbi Aaron Kotler - CEO of BMG Yeshiva in Lakewood, NJ and Rabbi Mendy Carlebach - Director Chabad of North & South Brunswick were honored with lighting the Menorah candles following the Governor lighting the Shamash candle.